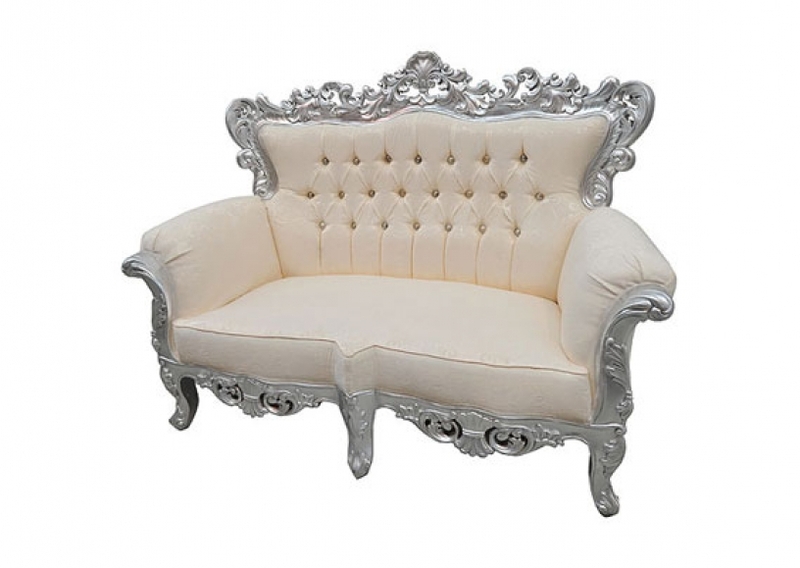 Today we are introducing our new ornate silver wedding sofas to our already-comprehensive range of wedding furniture. These luxury wedding sofas for hire are perfectly suited to Asian weddings, though in reality, almost any special occasion can benefit from hiring sofas such as these. The sofa has an intricate, ornate pattern which provides a stunning visual piece of furniture for your special event. Of course, top quality furniture doesn’t just look great, it also needs to be comfortable, and this is precisely what this wedding settee delivers with its cream fabric upholstery and the fact that it cushioned on both the seat and the rear. With its silver frame and cream upholstery, both these colours lend themselves to almost any event décor or styling that you already have, and so these wedding sofas are ideal for large venue weddings, hotels or marquees where you want to provide additional furniture for your guests. you might also want to hire this sofa together with our ornate silver armchairs which are also available to hire right here at Event Hire UK. Event Hire UK is able to service most event requirements in the vast majority of locations across the country from our nationwide network of sales and distribution centres. Do make sure, however, that you book your wedding furniture as far in advance as possible as these pieces of speciality furniture hire and unique furniture hire often get booked up quickly, so do try to avoid any potential disappointment. You will find these new ornate silver sofa chairs within our settees and armchairs section online, which lies within our wider furniture hire section. To discuss all your upcoming wedding furniture hire requirements, contact us today by phone or email and one of our expert sales team will be delighted to provide you with all the information you need and help provide you with a seamless hire experience. Contact us today.